It was so exciting to receive my 2016 SOAS Ambassador kit. I’ve shared some pictures on social media, but haven’t had a chance to blog about it until now. Each year the box that the kit arrives in is pretty cool with cute slogans on it – I just wish I’d taken photos of all of them! It’s so exciting when that parcel arrives on my doorstep! The 2014 beanie was plain black with a SOAS patch on the front. It was subtle and I wore it a lot. The 2015 year beanie was LOUD! It was also totally on trend, with a really cute over-sized bobble. It is an absolutely gorgeous shade of teal, which is the only negative thing I can think to say about it – it’s not quite the same colour palette as the rest of the kit. This year’s beanie is really cool with stripes that exactly match the team kit. Fortunately, the weather hasn’t been too bad here since it arrived, so I haven’t worn it, but I’m sure it’ll come in handy later in the year. Each year we have received a trucker hat as part of our team kit. I know the trucker cap was really popular with lots of the other ambassadors, but I have a teeny tiny head, so I haven’t really worn mine. Anyway, they’re all pretty cool if you can wear them with the most recent two being the most attractive. 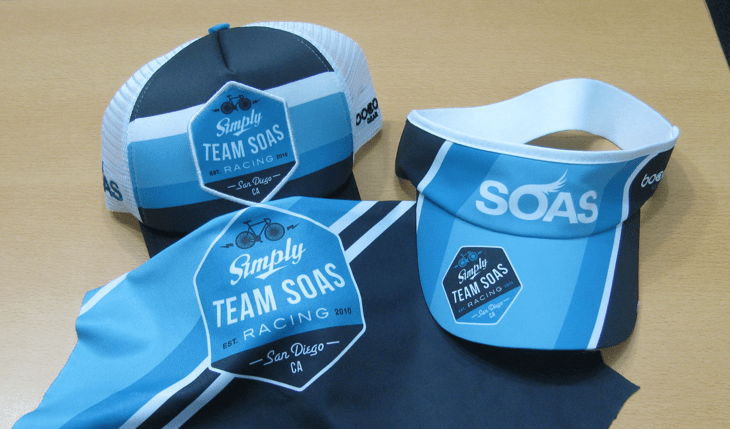 Partway through 2014, we were able to order visors and last year and this year they were included in our SOAS ambassador kit. For the first couple of years, I had to get my mum to adjust them as I have a tiny head, but this year’s visor seems to fit me better, which is great. Don’t see this as a criticism of SOAS. I am a hat lover (I have an entire Facebook album of me with things on my head), but almost all of them have to be altered to fit me. In 2014, our team kit included a running vest and a casual vest. The casual vest was an unusual swing-fit cut. I didn’t wear the running vest very often first of all as I’m quite self-conscious and my only experience of running vests was wearing my running club vest which chafed me badly. However, as I became less self-conscious, I wore it more and more and it became my ‘go to’ item of clothing for parkrun. The 2015 vest was an amalgamation of 2014’s two vests. It is a more casual cut than the running vest but is made of a technical fabric. I like the subtle design of the 2016 vest, and although I thought it felt a bit loose first of all, now that I’m a bit bigger I’m grateful that it’s a generous size! As an alternative to the casual vest, in 2015 we received a crop top. In 2012, I bought a turquoise crop top as I had to wear a turquoise vest (cut for a man) for a team event and I was worried that my sports bra would show. I realised that wearing the crop top was more comfortable than wearing a sports bra – especially for longer events, so I was delighted when SOAS added them to the range. I’ve since ordered several more from SOAS and like the design of this year’s top. This is where being self-conscious influenced my thoughts in 2014. I have extremely large thighs. If I don’t exercise and eat sensibly then this is the first place where I gain weight; it is also the last place where I lose weight. About 8 years ago, I lost enough weight to feel that I had slim legs, but I’m not at that stage now. Anyway, as a consequence of being fat my thighs can rub together and chafe when I run, so I usually wear two-layer shorts – the ones with a pair of lycra shorts underneath them. I also found that my Team SOAS shorts were a little small in 2014. The cut changed last year and I now think they’re perfect. I just need the sun to shine a bit more so that my legs are more tanned! I wore my 2014 jersey a lot. I probably wore it more than any other bike jersey that I own. However, I am not the typical ‘carrot-shape’ of most triathletes. My shoulders and chest are definitely not broader than my waist and my hips. My jersey did not fit me as well as it could have done, although the style was very flattering. The 2015 jersey was made of a beautifully soft fabric and I ordered a smaller size, so it fitted me so much better. I wore it for almost every bike ride and it was one of the first items I packed for my cycling trip across Japan. This year’s jersey is made of a slightly different fabric again, but I love the silky feel and the cut. This is a toughie. I’ve loved all of the SOAS tri tops so far. However, the lake where I have to do most of my training and aquathlons is VERY murky, so the 2014 top just edges ahead as black is easier to clean than white! The jury’s still out on this one. I love all of the SOAS shorts that I have and only wear another brand when it is incredibly cold (then I choose full-length thermal bib tights)… or when I’ve had a laundry fail! In terms of fit and comfort, I can’t choose between the arm warmers, but I did love the SOAS wings design on the ones from 2014 and 2015. The 2014 socks were black and blue, in a shade that wasn’t identical to the rest of the kit. My cycling shoes are white, so I was torn about them, however, the socks were very comfy. In 2015 we had odd socks (one white and one black), which definitely made them quirky. I was torn as although they’re cute, my OCD likes everything to match! This year I have a pair of white socks that I love. I wore the 2014 hoodie a lot as it was comfy and cosy, however, it was also very subtle as it was black with just a SOAS patch on it. The 2015 hoodie was a shorter cut with a fantastic logo on the back. The length made it easier to wear with skirts and dresses, and it was a nice shade of grey. I loved it so much that I took it to Japan last year. The 2016 hoodie is made of a lighter material, which doesn’t work for as many British seasons. It has a striped design which goes well with the rest of the kit. As in previous years, the bottoms are sadly a bit lightweight for the UK most of the year around. I need something cosy to put on after training and races! However, I absolutely love the new running leggings. They are incredibly comfortable and look good on. The 2014 flip-flops were printed with the SOAS wings that were cool and the 2015 ones were turquoise and felt much sturdier. I’ve already worn the 2016 ones quite a lot – mainly for open water swimming. Other innovations that I love are the team knee warmers and the bib shorts. I would wear SOAS shorts all year around if I could, so having knee warmers means that I can wear the shorts almost all year round! The bib shorts are also very comfortable. They are slightly longer than the tri shorts, so my tan lines might not be as sharp as in previous years. The shorts are cut beautifully, but I’ve found that I prefer the tri shorts to the bib shorts. Evidence of my growing SOAS addiction. Which kit do you think looks best and why? Have you ever tried Skins? My Skins A400 are epic, worth a try if you get chance.